BANGI, 15 Aug 2012 – A survery carried out by a Rakan Muda delegation from The National University of Malaysia (UKM) found universities in Australia are more sensitive and caring towards the needs of their students with physical impairments than universities in Malaysia. 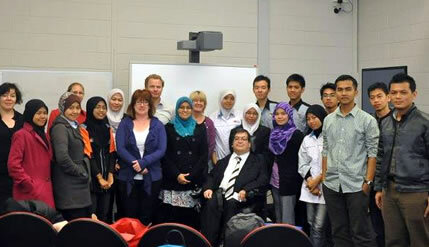 The delegation of 13 Rakan Muda students of UKM visited four public universities in Melbourne – RMIT (Royal Melbourne Institute of Technology), La Trobe, Monash and Melbourne University – to look at facilities they have to assist their students with physical disabilities. The delegation looked at problems, policies and the level of the administration of facilities being provided by the universities to their physically impaired students through discussions, interactions with the students and observations. The delegation was led by an advisor of UKM Rakan Muda, Nurul Safaniza Che Ani, the assistant registrar at Lestari (Institute for Development and Environment) and the Deputy Head of Ibu Zain College, Nik Mohd. Noor Faizul Mohd Saad. It also had consultation sessions with the Disability Liaison Units of the universities to look at how they assist their physically impaired students. They found that the universities are very sensitive towards the needs of their physically impaired student by providing various facilities to help them with their studies. This include providing technology enhanced facilities like JAWS (computer screen reading), DRAGON (voice recognition software) and other facilities provided for free to assist their disability students. Their findings gave the impression that universities in Malaysia are not that sensitive and caring towards their students with physical disabilities including providing proper space to enable them to study comfortably. They had submitted their findings to the Student Services Department of UKM which include among others a recommendation that UKM provide such facilities as available in the Melbourne universities if it wants to encourage the intake of physically impaired students.